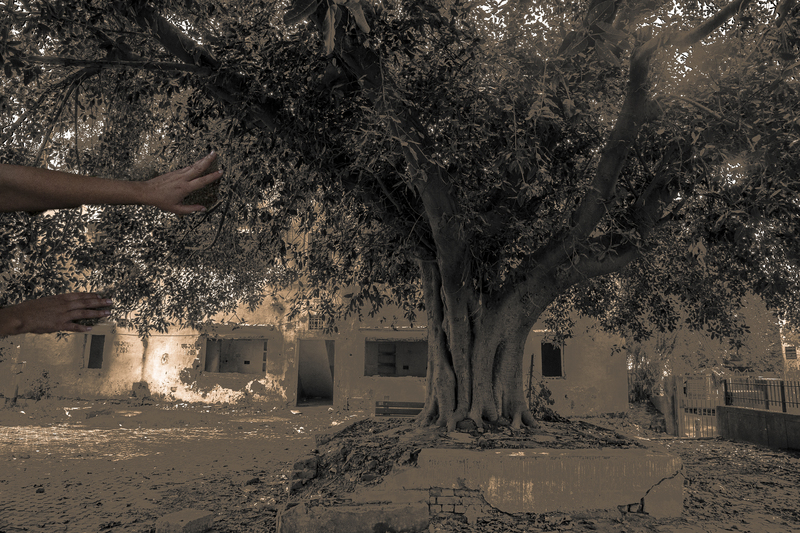 We continue our new section about trees and what they mean to us, from the branches that spread above our heads to the roots beneath our feet. 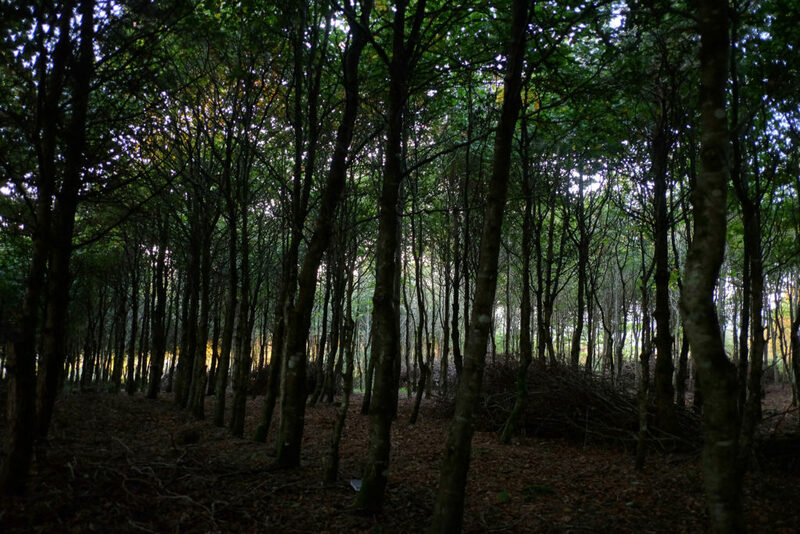 Our fifth contribution comes from artist William Bock, whose journey towards understanding the loss of Ireland's great woodlands led him to create an audio piece for a baby forest. 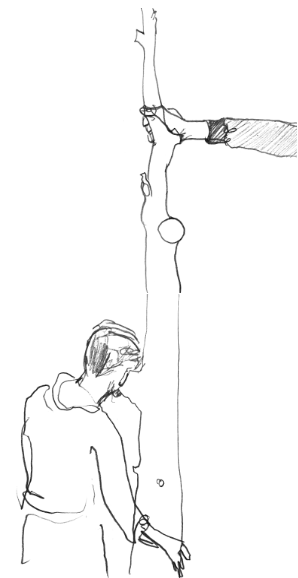 is an artist based between West Cork and London. His work explores relationships between memory, identity and belonging, and takes the form of photography, performance, object making, participatory events and site-specific installations. This is a story about a forest that is not here. Look at this postcard image: it has rolling green fields, grazing black and white cattle, cliffs that fall into the Atlantic Ocean below while gorse bushes and heather grow on rocky highlands rise up in the distance. It’s a beautiful, familiar image of West Cork in southern Ireland. It’s a place I left when I was 11. A landscape rooted in my psyche. But Ireland didn’t always look like this. Ancient petrified trees discovered along the west coast show that the island was totally covered in forests from coast to coast. Before the discovery of America, great tracts of land were still thick with the famous Irish oaks. These forests were fearful places to navigate; so dark, deep and filled with wild animals and wild people you could easily get lost or die trying to escape. The forests would have been less navigated and understood than sailing out on the Atlantic. I’m 35 now, and this forested world is almost beyond imagining. It is hard to think of getting truly lost in Ireland today. I’m more likely to be shocked by an electric fence on my walks than getting lost in the woods. This idea of a ghost forest, operating in a void of space, time and memory, is a strange and attractive idea to me. It took me on a path to uncover this story of loss. Drawing of the Ogham and runic inscription of the Killaloe Stone, County Clare, Ireland. Their orientations are: right of the stemline, left of the stemline, around the stemline, through the stemline, across the stemline. Ogham is climbed (i.e. read) as a tree is climbed, i.e. treading on the root of the tree first with one’s right hand before and one’s left hand last. After that it is across it and against it and through it and around it. Originally eight letters of the alphabet were named after birch, alder, willow, hazel, pine, ash, yew and of course oak. There is poetry to this human and tree relationship. We both cling to the earth and reach for the sun. We both feed on water and drink from the air. We are both collaborative by nature. But trees experience time in a very different way to us. The hulking 1,000-year-old ‘Brian Boru’ oak still stands in County Clare, a witness of the countless lives and passions of the humans that have passed under its boughs. It’s named after the King of Ireland, famous for uniting the island’s many warring clans. It is one of the oldest trees in Ireland and is said to share Brian Boru’s birthplace. Although rare in Ireland now, the oak was a sacred tree for the Celts and traces of them still exist in the place names across the country: Derry (Doire), meaning ‘oak woods’, Kildare (Cill-dara), ‘the cell or church of the oak’ and Lough Derravara (Loch-Dairbhreach), ‘lake of the oaks’, to name a few. 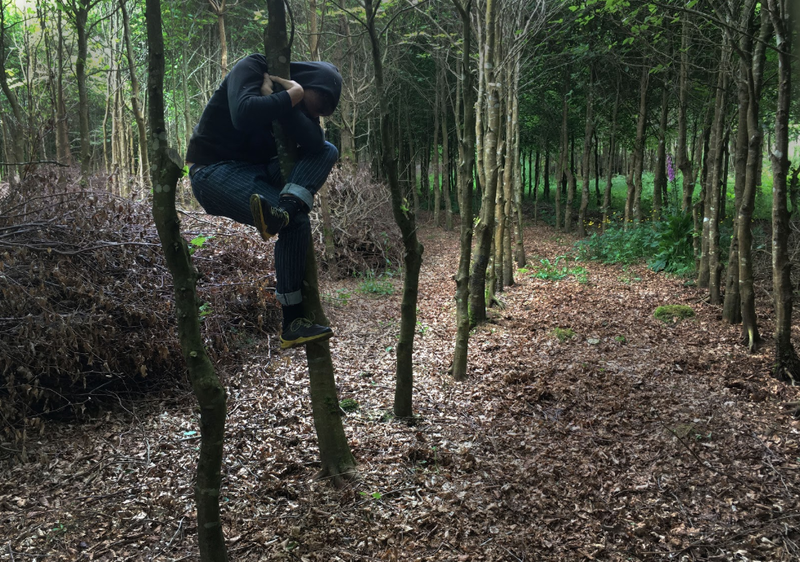 William Bock: Tree Hugger 2018 – Foherlagh, West Cork. Picture taken in the Baby Forest during research for Beech Bark Book. The legacy of the Irish forests stretches over time, merging ancient spirituality with the modern economic and political landscape of Ireland. The remaining oak forests of the 16th century motivated England to accelerate its colonisation of Ireland, whose precious resource of hardwood helped to build the English battleships and furnish their vast vaulted cathedrals and seats of power. British boats like the Watchful, built in 1804 out of Irish oak, transported emigrants fleeing from the horrors of the 1840s potato famine. These ‘coffin ships’ were ill-equipped and overcrowded vessels which resulted in many deaths on board and on arrival. The dark and fractured journey of the Irish oak echoes the complex and often unspoken relationship the Irish have to their land. The lost forests of Ireland are woven into this story. Many centuries of human influence on the natural environment have made their mark, dramatically changing this land and the people who live on it. I am an artist born and raised on the coast of West Cork, the south-west tip of Ireland. I have left and returned to this place many times but it was only recently that I see how the rugged land I once knew is being transformed. 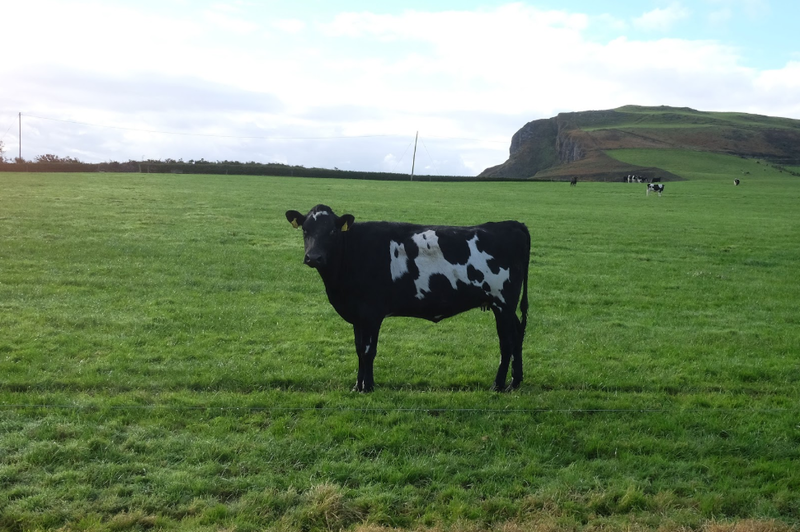 New pastures are now vast green areas, stripped of rough growth, hedges and rock, seeded with grass and sprayed with chemicals to avoid further growth of weeds. The sounds have changed too. The call of the pheasants in autumn used to echo through the thickets but fewer of these thickets remain and so fewer pheasants are heard. The wild bog flowers, field mushrooms and giant puffballs I remember seeing and picking with my mother as a child are now a rare sight. There are very few native woods in this landscape. In fact only 2% of Ireland is forested with native broad-leafed trees, the equivalent to half the size of County Wexford. Due to the recent removal of tree-protection legislation, a native Irish tree is more likely to be cut down now than it was five years ago. Fewer restrictions on tree cutting means that there has been a boom in hardwood logs being sold countrywide. The sun-filled timber is steadily disappearing in the hot blaze of our stoves. William Bock: Drawings produced in the forest during research for Beech Bark Book. Fluctuating economies like these mirror the increasingly extreme changes in the weather. This summer saw temperatures in Ireland rise dramatically. The sun poured down from clear blue skies every day. There was no rain for a month (unprecedented in Ireland). Cattle drank the wells dry and the heat burnt the grass for their winter feed, the effects compounded by the lack of tree cover. The land was pushed to its limit, turning from green to brown. As an artist I use walking as a research tool, as a point of connection with the land and the people living on it. It is during these walks that I see changes in the environment. Walking slows down my movement and forces me to notice, to listen, to touch, to smell and to allow for chance encounters with others. Beech Bark Book is a one-person audio piece I developed with the spirit of this approach. It is designed to be listened to on headphones while walking through a forest in West Cork. I was interested in how I could bring the ancient Irish forest landscape back into the minds and bodies of the listener. My experience of being inside this forest has a powerful effect. 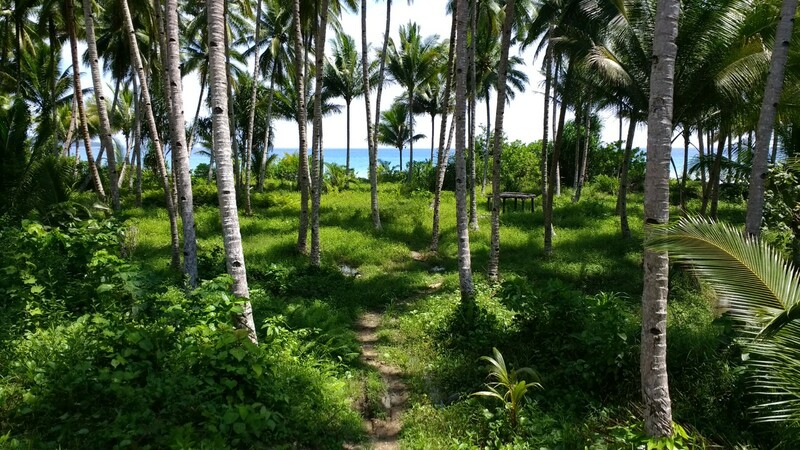 Walking under the green canopy I see thousands of points of light shimmering through the leaves and hitting the ground. I place my open sketchbook down and discover that each circle of light is in fact a projection of the sun itself. The forest is secretly being its own camera obscura, absorbing the outside world and transforming it. In this instant it strikes me that the forest is the origin of technology. It is a book, it is a camera, it is a church, it is even the phone in my pocket. The forest is a place of discovery, invention, destruction and renewal. William Bock: Many Suns 2018 – Foherlagh, West Cork. 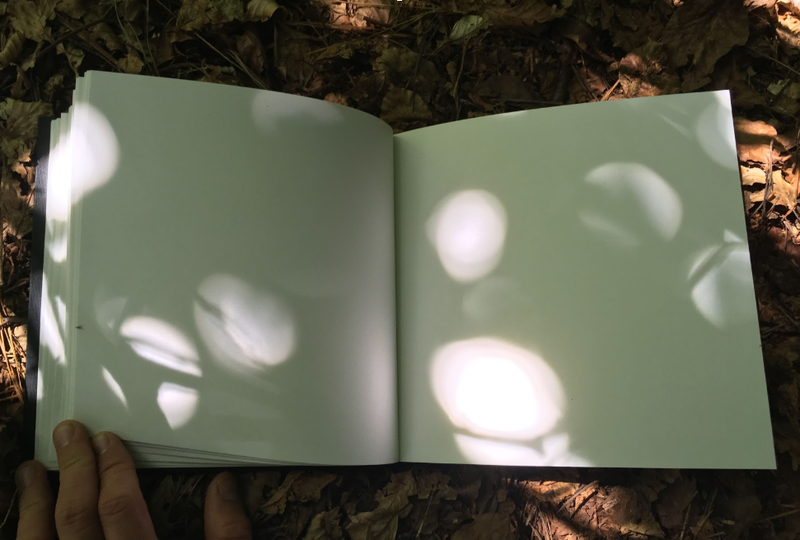 Natural phenomenon of light shining through the tiny aperatures between the leaves of trees, throwing projections of the sun onto the forest floor. 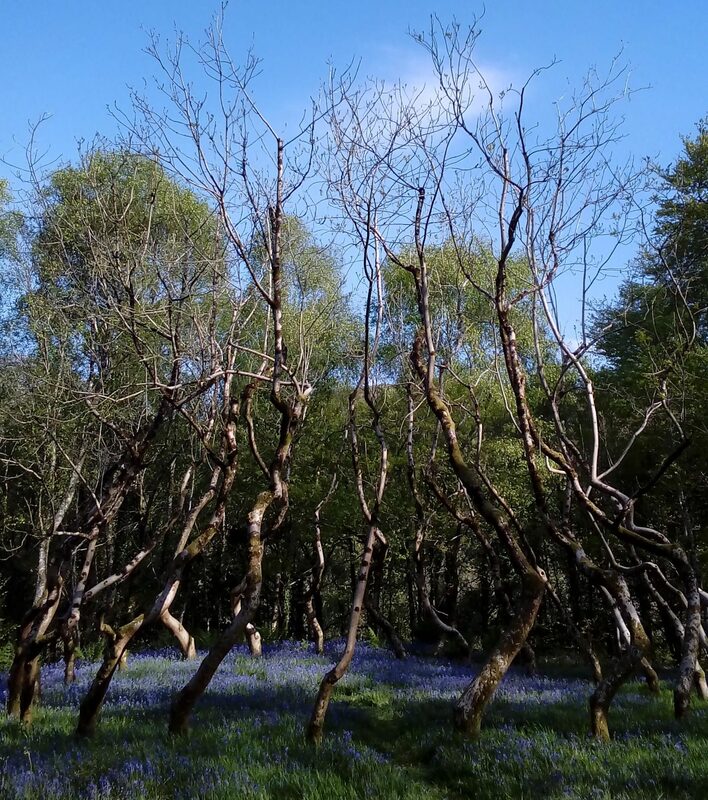 These 23 acres of planted forest in Foherlagh, West Cork are tended by artists Tom and Sue MacCarthy who also run an online artist ‘colony’ called Baby Forest. They use excess wood from fallen trees to fuel their central heating, make their own artist-grade charcoal and use the emerging forest as a site for exhibitions, artist residencies and events. Planted with beech trees (although not originally a native tree to Ireland, and far from wild), they have created a beautiful imaginative space giving its visitors a vital connection with the forest. Being someone who is born in Ireland but not connected through Irish blood, the non-native beech was a fitting start to talk about origins and ancestral paths. My Polish/German surname ‘Bock’ is derived from the High German name for the beech tree, Bok, and is said to be where our word ‘book’ comes from. 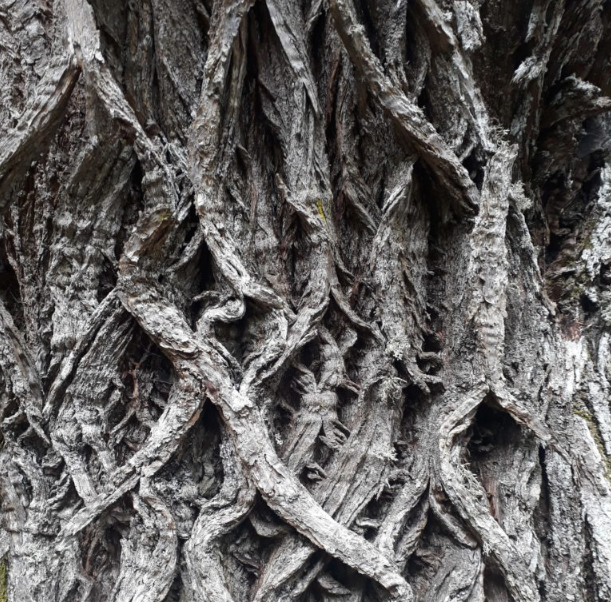 It brought the etymologically entwined human and tree back into focus and offered me a voice through which to tell this story. My walks in West Cork continue and so do my conversations with people here. I’m keen to hear more voices and hopefully give voice to those who may not be heard. I know there are many more perspectives than my own which include local farmers, environmental campaigners and conservationists to name a few. Beech Bark Book feels like a starting point which opens up the story of old Ireland within the genesis of this new forest, a place of great potential and hope. You can listen to the audio by clicking below. 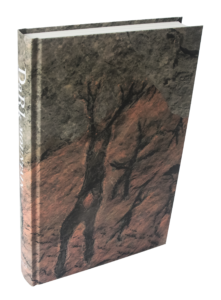 Beech Bark Book is written and narrated by artist William Bock, commissioned by Baby Forest and featuring the music of Caoimhin O Raghallaigh and Jon Hopkins.